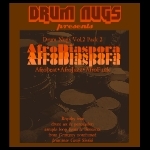 AfroDiaspora is available for $20. Owners of Beats & Breaks or LatinTing! can get AfroDiaspora for $10. 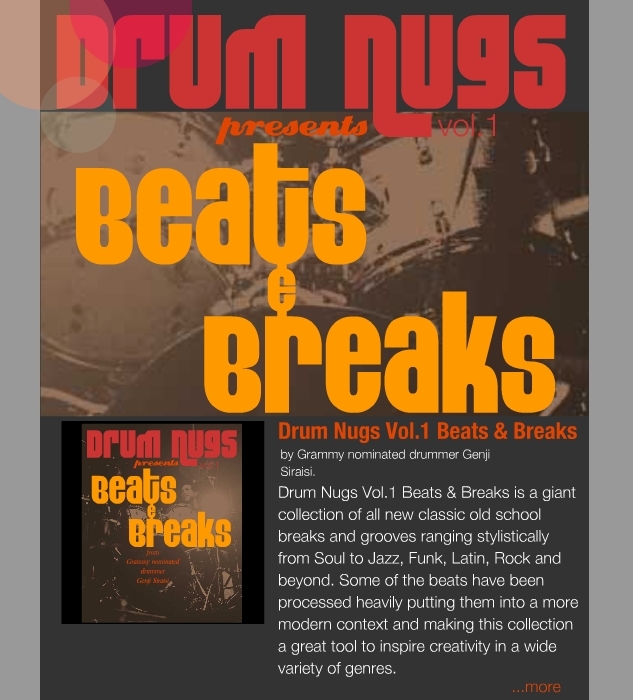 Drum Nugs Vol.1 Beats & Breaks drum loops are being offered for a limited time at the No Brainer price of $10 until 4/1/11 after which the price will be $30. In anticipation of the release of the 1st Pack of Drum Nugs Vol.2 “LatinTing” – Drum Nugs Vol.1 will be offered for a limited time at $10. To sweeten the deal anyone who has purchased Nugs Vol. 1 will be able to purchase one Vol.2 pack at 50% off at the reduced price of $10. Vol.2 will be comprised of 4 packs in total, each costing $20. 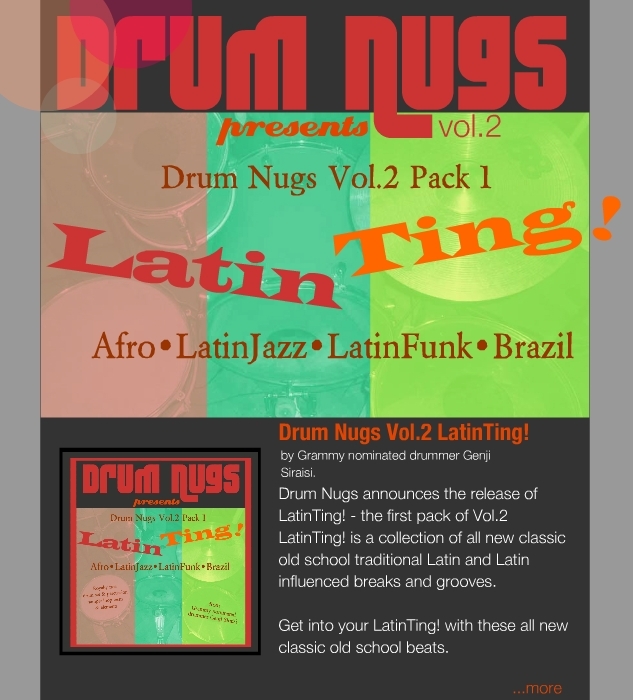 The 1st Pack of Drum Nugs Vol.2 is “LatinTing” release date 4/1/11 – traditional rhythms as well as beats influenced by Afro Cuban, Caribbean, Brazilian and Latin Jazz/Funk grooves. Genji Siraisi (Producer, composer, drummer and founding member of the Grammy nominated group Groove Collective) Continues his series of live drum loop packages for the Drum Nugs collection. 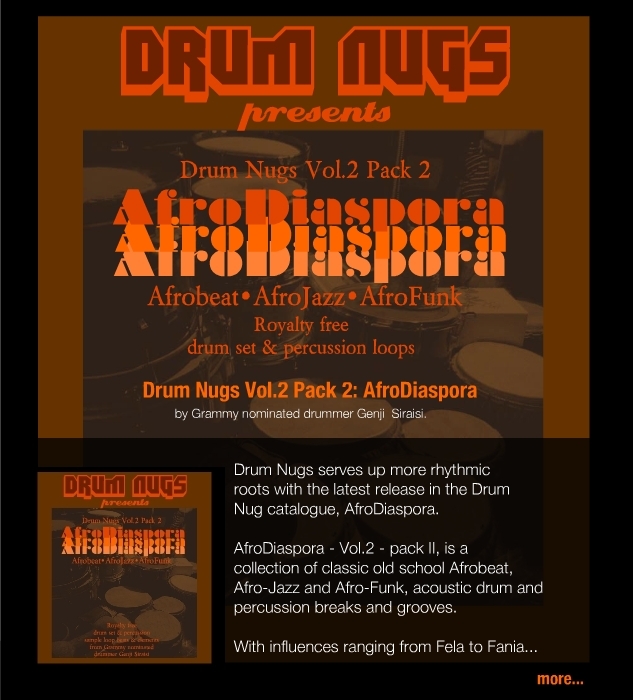 Drum NugsVol.1 Breaks & Beats is based around a series of recordings done on different kits in various venues and if that wasn’t enough variety was recorded in four different cities in two countries. The Drum Nugs collection mostly fall into the acoustic breakbeat category but they range stylistically from old school breaks to Jazz, Latin, Rock and beyond. Some of the beats have been processed heavily putting them into a more modern realm and making them suitable for a wide variety of uses. If your looking for that human drum element, to add some grit to your tracks or just some new old school breaks to play with this collection is for you. Vol.1 consists of 631 AIFF loops available for $30 offered for a limited time at $10 until 4/1/11. Listen to examples and get free downloads here.